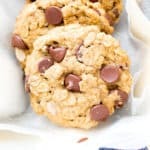 Peanut Butter Chocolate Chip Oatmeal Cookies (V+GF): An easy recipe for soft, deliciously textured cookies with oats, coconut, and LOTS of peanut butter and chocolate. Vegan and Gluten Free. Confession time: peanut butter and I weren’t always besties. Okay, now before you gasp and guffaw over this confession (wait, you guffawed? ), hear me out. We’re all friends here; this is a safe place for exposing our most embarrassing, most vulnerable vulnerabilities and such. Right? ☺ For instance, I tend to me be dramatic… again, only with my pen. Erm, keyboard. No judgments, right? Anywho, back to PB. Well, for a long time throughout my adventurous youth, I did not like peanut butter. Not one bit. 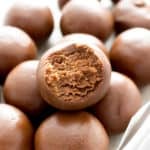 It was so dry, too salty, not salty enough, NOT chocolate, and so many other perceived-to-be negative attributes. But worst of all, I feared and respected it. Yep, exactly like how Danny Castellano felt about the sea. Okay, so do you remember that ridiculously torturous Got Milk commercial with the dog? Omigosh, I feel bad just thinking about it! Okay, if you haven’t seen it, this is what happens (more or less according to my patchy memory): Some evil kid holds out a ginormous spoon of peanut butter to a dog. The gorgeous, kind, and completely unawares dog starts licking the spoon. Happy and ignorant of what’s to come, of course. Dun dun dun!!!!! Alright, this is some kind of scene out of a Hallmark card right? What’s Demeter tripping about? Why is she talking in third person? Let me tell you why—and hey, maybe some POV distancing helps me to cope with the torture that is this commercial. Okay, so the dog is licking the peanut butter and in basic doggie heaven. Then, the spoon gets taken away and the dog begins licking its lips, to somehow be able to swallow all of that peanut butter. But it doesn’t happen. The dog just keeps licking it lips or whatever, going on and on… And it has no clue what to do. I mean, where is that evil kid with some water or… ya know, milk?!? And so the commercial ends on that stunning cliffhanger. Will the dog get some kind of water so it can just go play in a pool or chase butterflies? And that, my friends, is why I feared and respected peanut butter. Eventually I grew up… ish. And realized, hey! I can and will get my own glass of milk/water/coffee to go with any peanut butter goodness that I please. There’s no evil kid here! I’m not a dog… Huh. Whoever thought I’d say that sentence? Anyway, once you get peanut butter (and the need for liquid accompaniments), you just GET it. It’s not dry; it’s thick and rich. It’s not too salty; it’s just right. It’s still not chocolate, but guess what? Chocolate and peanut butter are even bigger besties than me and peanut butter. Or Chandler and Joey. Or Ross and, um, Dinosaurs. Alright, now I see how I have the attention-span of a dog. Maybe that’s why I felt for the little guy so much. Ahem. Cut to a decade later and my love and admiration (isn’t that so much better than fear and respect?) for peanut butter is vast. Think: the amount of peanut butter that Americans eat in one year vast. Fun fact: that’s three pounds of PB per American per year. At least according to the Texas Peanut Butter Board. 😉 Geez… that must be a delicious board. So here we are, embarking upon another peanut butter love recipe. 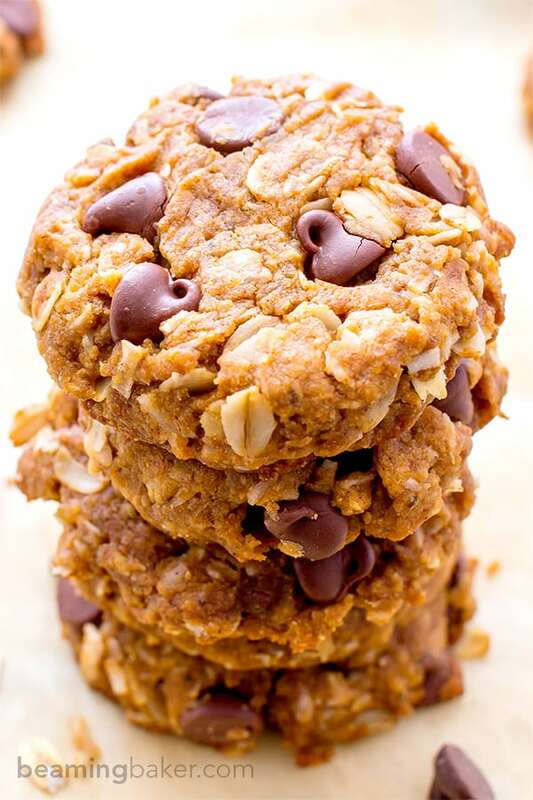 Welcome friends, to this new, amazing, delicious, and just perfect Peanut Butter Chocolate Chip Oatmeal Cookie. Gather ‘round, grab a super large mug of coffee, glass of milk, or just plain ol’ water. It’s time to get your peanut butter on! 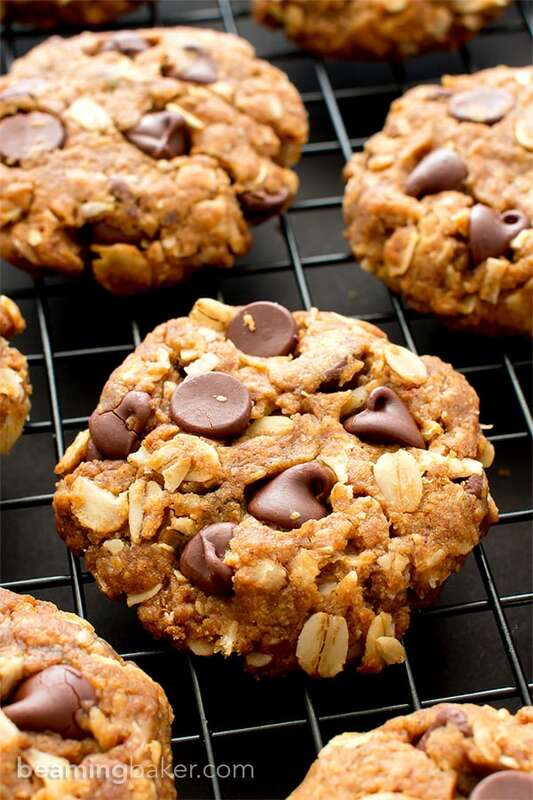 These cookies are the perfect marriage between peanut butter and chocolate. Doesn’t just seeing those two ingredients together make you feel good? 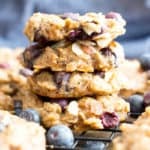 ☺ You’ve got the rich, nutty, pretty-much indescribable peanut butter nirvana delicately balanced with sweet, dark, blissful dollops of chocolate chips. Then, a complementary appearance of lightly crunchy shreds of coconut. 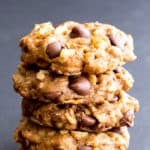 Peanut Butter Chocolate Chip Oatmeal Cookies (V+GF): An easy recipe for soft, deliciously textured cookies with oats, coconut, and LOTS of peanut butter and chocolate. In a medium bowl, whisk together the dry ingredients: oats, oat flour, coconut, baking soda, baking powder, cinnamon and salt. In a large bowl, whisk together all the wet ingredients: peanut butter, coconut oil, coconut sugar, maple syrup, flax eggs and vanilla. Add the dry mixture to wet mixture. Using a rubber spatula or wooden spoon, stir and fold until you get a cohesive dough. Fold in chocolate chips. 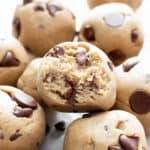 Using a 2-tablespoon cookie scoop, scoop 2 tablespoon-sized cookie dough balls onto the cookie sheet, spaced evenly apart. Flatten to desired shape--these cookies won't spread too much. Bake for 8-10 minutes. Using a flat, heatproof spatula, carefully lift the cookies off the baking sheet and place onto a cooling rack. Allow to cool. Enjoy! 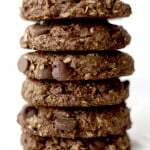 -*You may substitute coconut sugar with brown sugar. 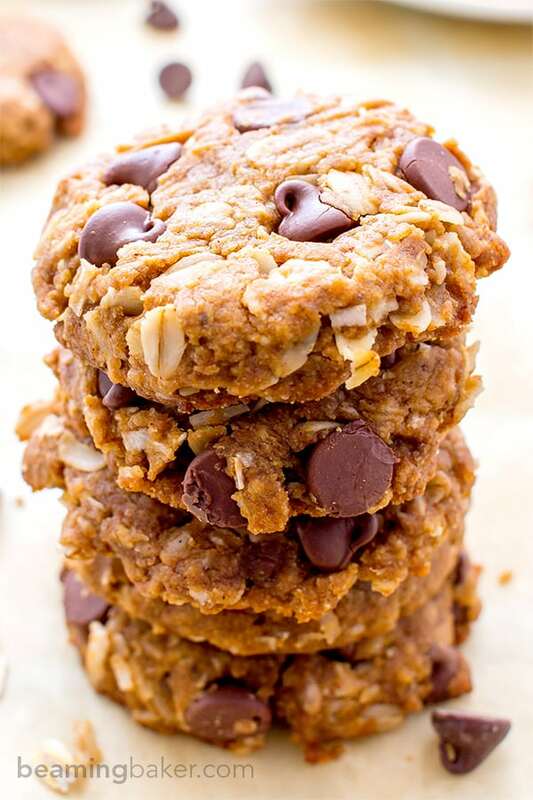 - Adapted from my Best Vegan Peanut Butter Coconut Cookies. I’m sensing that you like peanut butter. 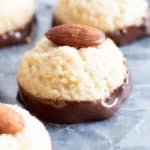 😉 How about trying my much-loved, most popular recipe on the blog: No Bake Peanut Butter Coconut Bites (Vegan, Gluten Free). Like a chocolate chip cookie, but more portable. Try my Chocolate Chip Cookie Dough Truffles (Vegan, Gluten Free). You’ll just love it. These cookies are the most amazing delights I have ever eaten in my life, spanning almost 6 decades! And totally legal in my new cancer fighting food regimen by using dairy free chocolate. Thanks for sharing this incredible recipe. I’m glad I made a double batch but am paying at the scale! Totally worth it!!!! Thank you so much for your lovely comment, Clint! 🙂 I’m so happy that you enjoyed these, and even happier that they fit into your food regimen. And seriously, a double batch is just smart baking. 😉 Enjoy! 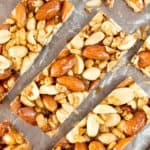 I have a quick question, I have rolled oats but they’re quick oats, can I use these for this recipe? 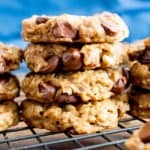 I want to make these amazing looking cookies but my husband hates coconut. Any ideas for a substitution? 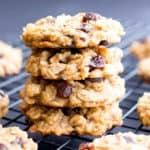 Hi Jocelyn, you could try a combo of more oats and mini chocolate chips. 🙂 It’s my pleasure. Happy baking! This cookies were delicious and help with my 3pm snack attacks! Thank you. I was wondering if it would work to bake these as muffins…… any comments or thoughts on how to do so? Hi Dalissa, so glad to hear you enjoyed these! 🙂 3pm snack attacks are the craziest! 😉 Do you mean as cookie cups or traditional muffins? Yes! Would the steps be that much different? I love, love this recipe that I made by ‘accident’. I was planning on making an almond butter recipe for an event but saw too late that it had to be chilled for over an hour, so I made yours instead with almond butter. You used a lot of basics I keep stocked (shredded coconut, coconut sugar, etc.). They tasted like Almond Joy cookies. The only problem was I showed up to the event only to discover it was the following week. Content to make them again I freaked when I couldn’t find the recipe again. I had forgotten about the almond butter switch, so I was using the wrong search criteria. This time I was set on chocolate/cranberry so I mixed the two. They’re still in the oven. I just made these cookies and they turned out NOTHING like everyone else is saying. Followed the recipe exactly and they are not good at all. They are not chewy, they are dry and crumbly. I’m so sorry to hear that, Andrea. 🙁 I’m not sure what happened–this recipe has been tried around the world by many readers with success. Sounds like there was an issue with the wet ingredient ratio. When you mixed the wet ingredients together, did it resemble caramel? Anyone ever try a different oil for theses? Curious! Thank you! Is it ok to omit cinnamon? The friend I am making them for has an allergy to it. Hi Brenda, yep, that’s totally fine! 🙂 Can’t wait to hear what you think. I followed the recipe and ended up with the most delicious cookies ever! I will give my friend half tomorrow but my husband and I are definitely keeping the other half. We’ve had two each already and are trying not to devour them all tonight. They are that good!!! My pleasure! 🙂 Woohoo!! I’m so happy to hear that you enjoyed the cookies! I think giving your friend half is a good and very tasty plan. 😉 I really appreciate you reporting back and letting me know your thoughts. Enjoy! I am not a big coconut fan. Can I just leave it out of this recipe and they will still turn out ok? I just found this recipe today and made them for my weekly treat. 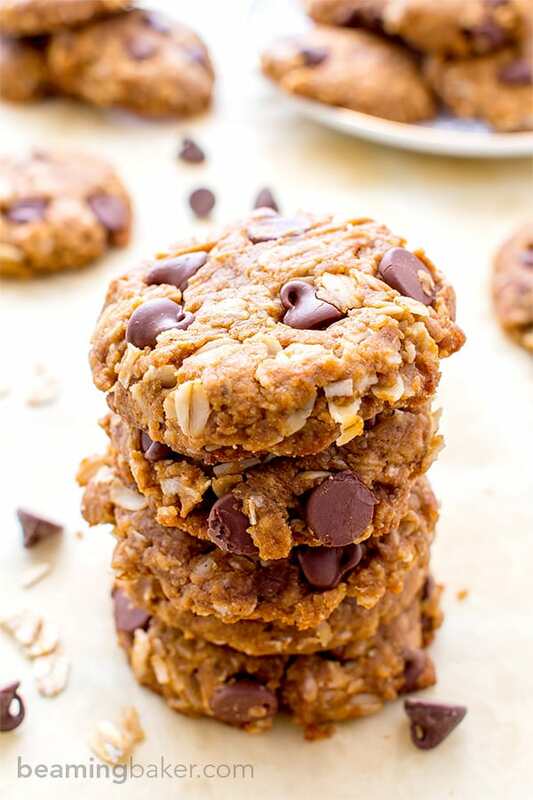 They are sooooo… good, chewy, crispy, gooey, coconutty, chocolatey, and so delish! I think these will become a staple for me. 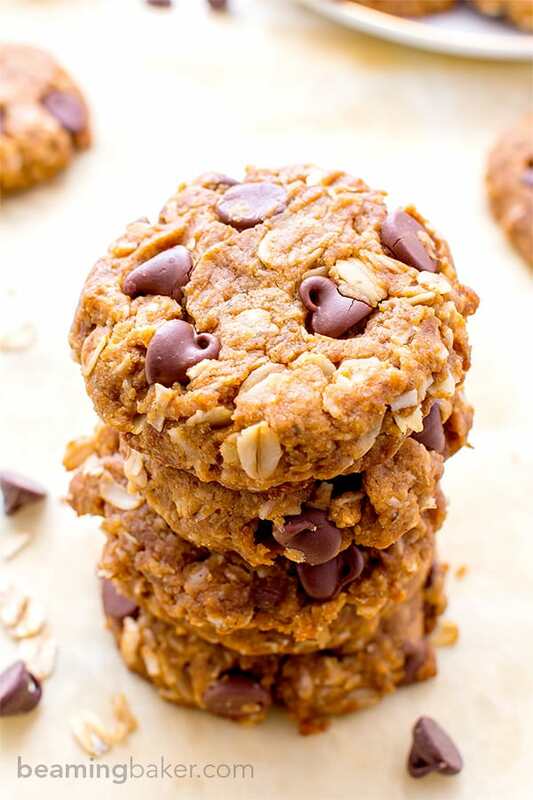 Love that they are vegan, use oats & oat flour and not too much sugar – while still tasting like a treat! Hi Peggy! I’m so happy to hear that you enjoyed my recipe. 🙂 Everything you listed is exactly what I was going for! 😉 Thanks for taking the time to let me know how they turned out for you. These cookies were a perfect snow day cookie! We always bake at my house on snow days and I wanted a new recipe to try. Well this will definitely be a new go to. I made the oat flour, used butter instead of coconut oil and two normal eggs. They were so yummy! Thanks for the keeper recipe! Baking on snow days is so much fun! 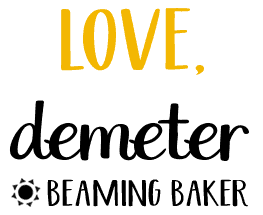 Loved hearing about your subs & homemade oat flour. Thank you for stopping by and letting me know. Enjoy! I was in desperate need of a chocolate anything and that’s when I discovered your recipe and it is perfect! I made some slight substitutions (had to). I ran out of peanut butter and maple syrup mid-measure and used almond butter and log cabin respectively to fill in the void. I can only make a few at a time and then store the rest as they are addictive. Thank you for sharing this recipe, I will be making this often. Hi Stacy! Desperate for anything chocolate: oh I have BEEN there! 😉 Glad to hear the minor adjustments worked so well! Thank you for taking the time to let me know. Happy baking! I’d prefer not to use the coconut since the person I’m making them for doesn’t like coconut. Can I just leave it out or do you think I need to substitute something? I’m looking forward to making these! Scrumptious cookies! I reduced the sugar to 1/3 and left out the vanilla because I didn’t have any. I also used a combination of tahini and peanut butter because I was low on PB. Boyfriend approved! Will be making these again! Fantastic! Love the tahini sub Dana. And glad to hear the BF enjoys them too! ???? Thanks for this recipe. It looks really good. I’m interested to make the cookies as crispy as possible. I plan to spread the dollop pretty thin on the baking sheet and to let the cookies bake a little longer than the suggested time. Do you think that will work? Any other tips? Hi Krystal, my pleasure! 🙂 Yes, flatten the cookies and give them a bit of room (so they don’t touch). Reduce bake temp to 325F, and bake for 20-25 minutes or so (making sure to keep an eye on them). Let me know how they turn out! Enjoy. The cookies are everything I needed them to be for my birthday month cookies. I had to delay making them for a while, but they were certainly worth wait. Your tips worked well for making them crunchy and I added pecans and a spice mix to for a good bit of heat. They are simply splendid. Thank you and Happy New Year!